CREATIVE NONFICTION BY ADREYO SEN "THE BOARDING SCHOOL PROTAGONIST"
It is early on the second day itself that I discovered that my plans of becoming the adored protagonist of my own boarding school story were, at best, premature. First, of course, was chota hazari, wherein we all lined up to receive a cup of tea and two homemade biscuits from the hands of the “bearers,” the school term for the jack-of-all-trades assigned to each house. I learned later that this same ritual serves as a kind of attendance-taking in some of India’s prisons. The two “bearers” were diametrically opposed in personality. One was a rather simple man with dog-like eyes and the other, Thakur, had the dissipated look and personality of a village drunkard. Not that I ever saw him drunk, of course. Thakur was to evince a great affection for me, declaiming to my parents when they came for Founder’s Day that “he comes and he sleeps and he goes,” a testament, possibly, to my comparative innocence. This meant forming an arch with my body, with my palms and my feet touching the ground. The grass seemed wet with dewy potential under my fingers. Breakfast was tea and toast that made no effort to pretend to be crisp. For us non-vegetarians (vegetarians had paranthas), there were cutlets, rumored to be molded in the armpits of the kitchen staff. I was impervious to this legend and had more than a few of them every breakfast. Assembly made me fall in love with the school. Mr. Mason, the Headmaster, took the assembly as he always did and, after welcoming the new boys, spoke about how that day, 5th August, showed how necessary it was to strive for peace – it was the day of the Hiroshima-Nagasaki bombings. In one of the classes after assembly, my bull-headed determination to be different, combined with my lack of knowledge of the school mores, got me into trouble once again. I was walking to a desk in the class when a moon-faced boy rushed in from outside. “Bags,” he said, throwing his bag on the desk. “I got here first,” I told him. “But I bagsed it,” he said, with the easy confidence of someone who is not used to having his will questioned. “Sorry,” I said, taking the desk. He dropped the issue as some of our other classmates pointed out that I was new. I was blind to the increased scrutiny of the other boys. As it happens, I learnt that “bags” was an integral aspect of life at Doon, that is, Dosco life. It seems inconceivable now to even question that someone can stake his claim to a seat or position by leaving even the meagrest of possessions there. The same boy took offence to my notebook a few weeks later, because I had transformed “The Doon School” logo to “The Doom School.” It was in vain that I pointed out that this was just a joke, a satire if you will. He took this as a sign of my seditious lack of school spirit. And years later, when I desperately strove to become Editor-in-Chief of The Doon School Weekly and then to do justice to my tenuous possession of that title, he was to lend his cheerful and quite oblivious support to my nemesis. It became quite clear to my dorm-mates as the days went by that I had no sense of personal hygiene. I had always been oblivious to my own body odour and, at twelve, still failed to understand the need for cleanliness. At home, there was always someone to bully me into a semblance of hygiene. And here, given that we showered together naked except for our swimming trunks and that the water was cold, my indifference to hygiene turned to a positive resistance. By the by, I missed out on the social aspect of the communal bathing: it was in the showers that the boys laid aside the mantle of their inchoate, fierce ambitions and chatted freely. I observed, with some internal hilarity, the growing scrutiny of Mrs. Lally and her inflamed proboscis. I didn’t take so kindly to Mr. Nair’s cutting and quite public remarks. He had a way of making me feel quite small. It was during the days that “Smelly” was being added to my “Spaz” label that I made the acquaintance of Mr. Yusoufji, a man whose company I would have done well to seek out more frequently. Mr. Yusoufji was a femininely gentle, short man who could always be found in the company of two or more of the younger boys. The older boys had gone through their Yusoufji phase and graduated to a world fiercely governed by house spirit. In his book-lined little room, he would discourse on books, or simply listen to the problems his friends were facing. Mr. Yusoufji had heard of me from the librarian, whose suspicious I had aroused by issuing a new book everyday. Rather in the aspect of an emperor meeting one of his loyal, but dim-witted subjects, I made my way one evening to his house. He immediately made me feel at ease. Mr. Yusoufji had a positive talent for doing that. I noticed with great delight that he had the same addiction my already-idol (Mr. Mountford) and I had: an addiction to Parker Vector pens. We discoursed legibly for hours on books (me showing my general ignorance as much as I tried to impress), until he looked at the clock with a rueful smile and said that it was time to throw me out. Upon my arrival at Martyn House, I was accosted by Mrs. Lally. She was impressed to hear that I had been with Mr. Yusoufji, but still insisted that I take a shower. It was around the same time that a surreptitious check was being taken of my sporting talents by my dorm-mates. I was quickly found wanting. At Delhi Public School (DPS), my previous school, I had won great fame for being able to kick a ball a great distance with my slab-like legs. However, the sporting fields of Doon were a far cry from the nebbish meanderings of “day-school swots” and it was quickly discovered that I had no sense of direction or even agility. So soccer was out. And then I remembered my harrowing training in tennis as a five-year-old at the Maharashtra Lawn Tennis Association and my later games at DPS, where I wowed Prateek and Gautam with the distance I could make the ball fly. Rajeev challenged me to a tennis match the Sunday after I made the outrageous claim that I could beat anyone at tennis. My mouth was my own biggest enemy my first year at Doon. Rajeev was Martyn Houses answer to the question of who would be the school captain of our batch. Foot House had its own contender: the same moon-faced boy who took offence to my changing the “Doon” on my notebook to “Doom” – Nitin Rai. Rajeev was tall and walked with a loping grace. He played for his main house, Tata, in all the games the school had to offer. My match with Rajeev didn’t fate very well. I kept hitting the ball so hard that it flew out of the court, still vainly clutching at the idea that the harder I hit, the surer I was to win. When I finally conceded that the match was going nowhere, Rajeev urbanely asked me if I would mind serving as a ball-boy in the next match between him and a smirking dorm-mate. Utterly humiliated, I was glad to grovel in his direction. At the beginning of that year at Doon, I had also boasted of a talent I was sure I possessed: a talent for painting. This upset Jupiter, who in a house of many ‘the’s, was ‘the artist.’ An otherwise phlegmatic boy, he set out to unmask me. We each took two hours to produce our masterpiece. Jupiter produced an ethereal woman in shades of black and gray. I produced a multi-coloured house composed entirely of squares. I wonder why I never said that I had a talent for writing. I think this was partly because writing was such a basic part of me that I never thought of it as a talent. Secondly, I am not sure that it was a talent the boys of Martyn House would have appreciated. Thus, along with the existing nicknames of ‘Spaz’ and ‘Smelly,’ I acquired another one, ‘Sidey.’ A ‘Sidey,’ in Doon School lingo, is someone who exists on the sidelines, with little-to-no participation in either sports or extra-curricular activities. The one thing I was good at in my first few months at Doon – apart from a sideshow talent I will reveal later – was getting excuse chits, excusing me from a couple of days of PT and Games at a time. I had learnt early on that my innocent face could allow me to get away with the most outrageous of lies. This coupled with my general clumsiness – I was always falling on the bajri (pebbles) strewing the school roads and cutting myself – ensured me a constant stream of excuse chits from the jolly nurse of the Doon School Hospital, a woman who combined her duties with being the epitome of cheerful roundness. Even her name – Sangmo – was reminiscent of a large and melting bowl of rice pudding. I kept my excuse chits in my pencil box and even blatantly showed them to my dorm-mates. I think I had some vague idea of having them bound at a later point. And whenever my excuse chits ran out, I would open one of my scabs and go, teary-eyed, to the nurse to get a new one. My flagrant abuse of the excuse chit system came to an abrupt end when the doctor of the hospital, a squash fiend, decided that the reason for my malingering was a homesickness. My parents were called and in the mean time, I vegetated happily in the hospital, reading from its vast library of discarded pulp fiction novels, drinking endless cups of tea and eating third and fourth helpings of the chota hazari biscuits, all-the-while convinced that I was dying if some grave and mysterious illness. My parents, when they came, were quick to disabuse me of the notion. An outing where I gobbled down naan and reshmi kabab eased me back into a school routine with the horrible specter of PT over my head. However, I’d hit upon a simpler solution to the problem of P.T. I would simply not show up. It was right around the time that my dorm-mates had deemed me unworthy of their attentions that the rest of the school suddenly declared me a celebrity. It began innocently enough. I had always been a fast reader and one of my seniors, observing me read, decided I was just flipping the pages. He took the book from me and asked me to tell him the story thus far. He was amazed by my reply. In fiercely insular worlds like Doon, where there is no distinction between the public and the private, such news spreads rapidly. Soon I was being waylaid by passing seniors and asked to demonstrate my speed-reading prowess. I did so, with a convincing affectation of modesty. The more suspicious seniors set little traps for me, but I passed all of them. One such senior was Dwaipayan and he was to be my editor-in-chief the next year, when I joined The Doon School Weekly. Throughout the next year of my stay at Doon, I was to constantly have crushes on one senior or the other. He was my first and abiding crush. My dorm-mates were happy to bask in the reflected glory that I brought to Martyn House. Mr. Mountford was not so happy and told me bluntly that he thought I was seeking attention. 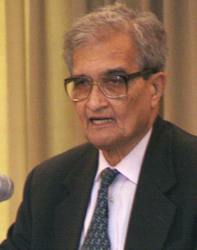 This was to ensure that for the entirety of my six years at Doon and my one year at St. Stephen’s, someone or the other was to either ask me to speedread, or if it was really true that Amartya Sen was my uncle. My seniors sensed a gold mine in my speedreading abilities and they asked me to write book reviews for them. I agreed happily, being fond of writing. The only payment I asked in return was a lock. I loved the green boxes they came in (the school store ones, that is) and envisioned a future in which I had a treasure chest full of such boxes. One of these seniors gave me a check instead, for Rs. 50, to be used at the tuck shop. Rs. 50 can get you quite a lot at that halcyon place, even if you choose to use your money brashly, and it is a sign of my depraved insanity that I chose to preserve the check instead. I was to write book reports and college essays for my seniors over the next few years as well. But I didn’t ask for locks anymore. I asked for friendship bands instead. One of my dorm-mates at Martyn House went on to do brilliantly at the Columbia School of Journalism and is probably pursuing relentlessly some corporate criminal or the other as I pen these words down. I’d like to think that I gave him his headshot in journalism, that his uncovering of my various gratuitous lies revealed to him that he had a positive talent for journalism. There was the time I declared myself the editor-in-chief of the Junior Doon School Weekly. I had done this in good faith, hoping to drum up support for such an endeavor from my recalcitrant classmates. Philip went to Faiz and asked him if this was true. I was summoned to Faiz’s gigantic presence and his hawk-like eyes and sharp nose towered over me as he told me he’d keep a watch over my activities in the future. And then there was the keychain I’d forgotten to return to Jaypee Manor after my parents and I checked out, that fateful trip to Mussoorie wherein I’d first learnt of Doon. When my dorm-mates inquired about this keychain, I told them it belonged to the room reserved for me and my parents on our regular visits. On his own subsequent outing, Siddharth Philip actually made the effort to ascertain if there was, indeed, such a room. So now, in addition to being a ‘spaz’ and a ‘smelly’ and a ‘sidey,’ I was also a ‘dhaap’: Doon School lingo for a fabulist, a weaver of tales, a Munchausener. But the most painful of Siddharth’s investigations into my nefarious character occurred thusly. I was constantly in the habit of trying to create a writerly persona – I was much more assured of my identity as a writer when I was a teenager than I am now. I decided that in lieu of the stem of a pipe, I would chew bones as I wrote. One dinner, they served mutton. I waited till everyone was leaving to place the bones of my meal in my bag. Somehow, this did not escape Siddharth’s attention. When I was busy at work, he grabbed my bag and running-waddled his way to the iron-grey figure of Mr. Devender Singh sitting at the front desk. Before I could catch him and before Mr. Singh could voice his displeasure he emptied all the contents of my bag on the desk. The textbooks within were much the worse for wear, since it had rained recently. In particular, my beloved copy of P.G. Wodehouse was now a fetching morsel of pink and blue. Somewhere within all the putrid debris were the mutton bones I had carefully hoarded. Siddharth pounced upon them. “Look,” he said gleefully. Mr. Singh looked. And then he looked at me. With ginger care, he put the bones in the dustbin and silently bid me to put my belongings back together. I did this with trembling fingers. I felt violated. Both by Siddharth and by Mr. Singh. But that same evening, before the close of “toye-time” (Doon School lingo for prep time, our little desk sets being known as ‘toyes’), Mr. Singh re-appeared with a precious gift for me. This was a file containing an abundance of lined paper, referred to within the school as Cambridge Sheets. That Mr. Singh should recognize my love for writing and that he should help me forget my misery in this most unobtrusive of ways touches me immensely even today.